Set in the waning days of the Regency Era, this unusual romance starts with a beautiful woman going to Parliament to demand a divorce from her husband, a duke. Serephina is one of the Dangerous Daughters sometimes called the Soiled Ss. Their father made a fortune in coal and was awarded a title, but the Daughters are looked at askance by the ton. Serefina landed a Duke and then disappeared. But now, three years later she's come back from America with her male business partner to open a tavern that the laws say she can't own because she is married. She needs the divorce. Moving back and forth between the aftermath of the divorce petition and when they first met, Serephina and Malcolm may have had a great love but has that chance been destroyed by outside forces and their own inability of share their feelings? 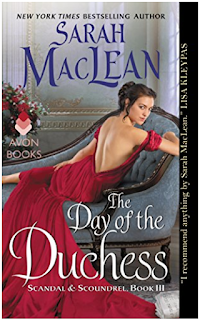 MacLean's storytelling style is unusual for this genre and adds a freshness and vibrancy to this enthralling romance.